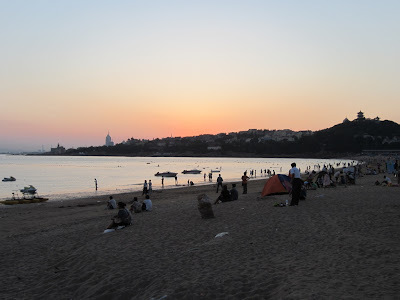 Today we received good news about the Special Issue of the Journal of Atmospheric and Solar-Terrestrial Physics (JASTP) about the EISCAT International Workshop held in Qingdao, PR China, from 5th to 9th September 2011. The Special Issue will appear in December 2013, i.e. in the present calendar year still. A few manuscripts will not make it in time, and they will be published in regular issues of JASTP in 2014, if accepted. Following a voting among participants of the recent EISCAT International Symposium at Lancaster, U.K., from 12th to 16th August 2013, the EISCAT Science Oversight Committee (SOC) has approved the motion that there will not be another Special Issue for the Symposium. However, persons publishing work presented at the Symposium are encouraged to refer to the paper having been presented at the Symposium in the paper's acknowledgements. 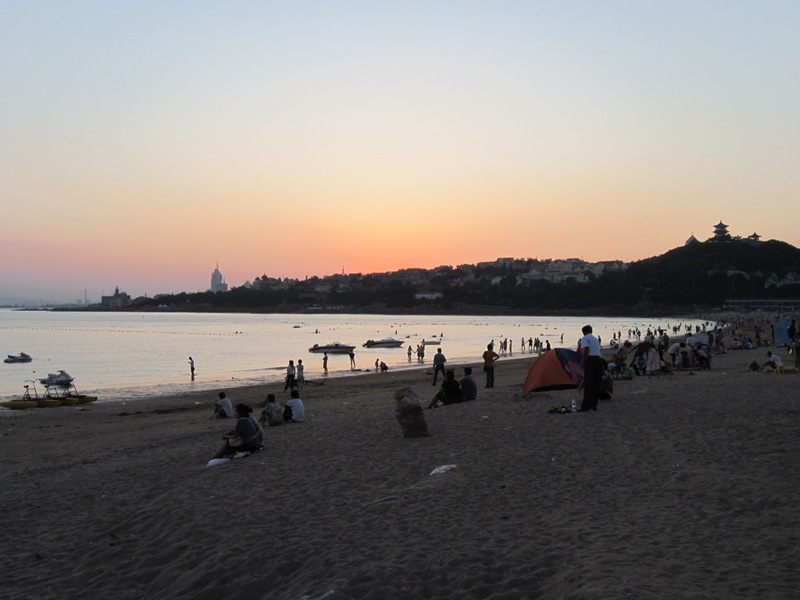 Photo of Qingdao beach sunset by Thomas Ulich; text via Mike Kosch. 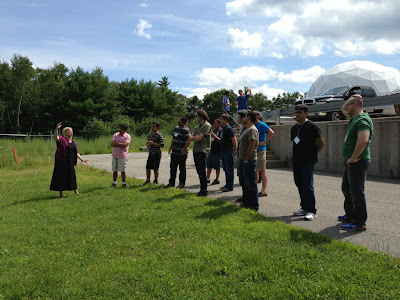 The most recent ISR School was held at MIT Haystack Observatory 29th July to 2nd August 2013, thus almost a month ago, but there's still something we didn't relay to our followers yet: the Student Presentations. The format of the incoherent scatter radar schools on both sides of the Atlantic has converged pretty much to a schedule, where lectures are held in the morning, and group work is done in the afternoons, and possibly evenings and nights. On the first two days, students are introduced to the basics of ionospheric physics, the basics of incoherent scatter, and to the capabilities of the radars. Thereafter the groups have to write a brief experiment proposal and send it to one of the instructors, who will give feedback. In the evening of Day 2, the proposed experiments are run. For this school, the AMISR system at Poker Flat, Alaska (aka PFISR) was used. The rest of the week's group work is then dedicated to studying the data from these experiments. The grand finale of the school is the day of the student presentations. Every group presents their results, and it's the rule that every member of every group has to present a part of the common work. Invariably the teams present very interesting results, which is owed to their enthusiasm and fresh point of view. Often the teams also inject some humour into their presentations: the photo shows a comparison of Hard Target vs Soft Target, which is an essential concept in the radar world. All in all the presentation day is a lot of fun for everyone involved. 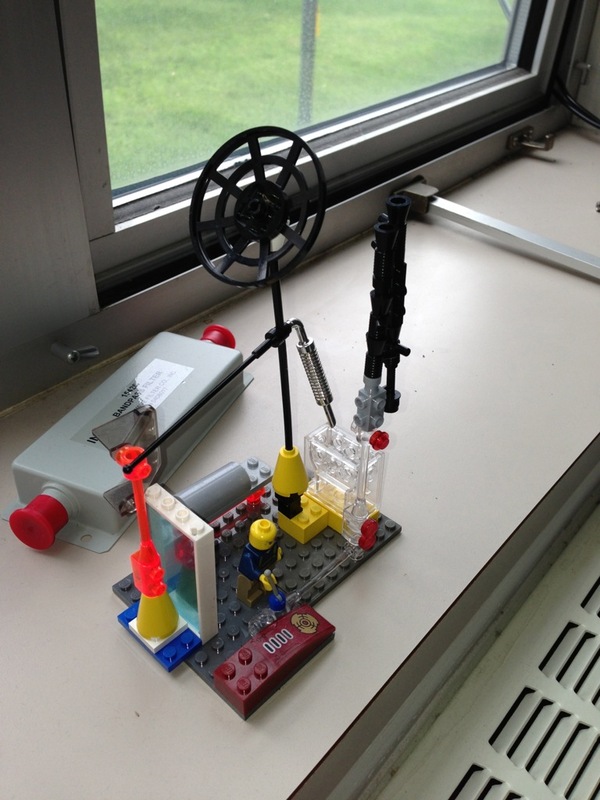 During the past school, we put a camera into the audience, and created the short time-lapse movie above. Photos were taking at 5-second intervals, played back at 25 fps. Enjoy. 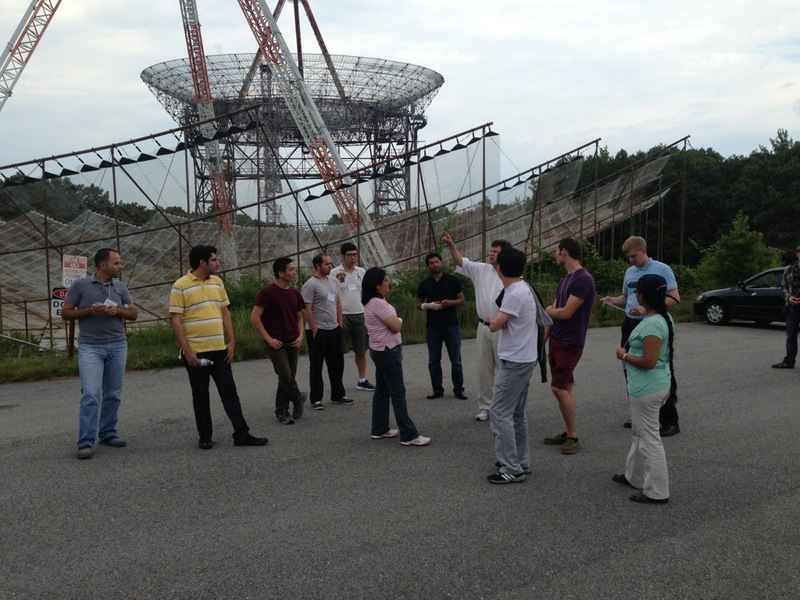 If you are interested in taking part in the Incoherent Scatter Radar School organised by our US colleagues, or indeed in the EISCAT Radar School: The next school will be the jointly organised US/EISCAT Radar School at Arecibo, Puerto Rico, 21st - 26th July 2014. Photos/movie: Thomas Ulich; click on the photo for a link to the movie. 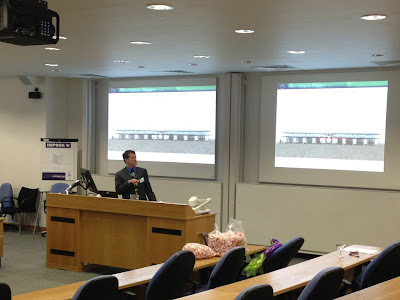 The 2013 EISCAT International Symposium was just held at Lancaster University, UK. When scientists gather (and most likely this will hold true for other professions), their conferences are usually made up of certain recurring building blocks. These often include an excursion or some sort of sight-seeing, a conference dinner, and a conference gift. 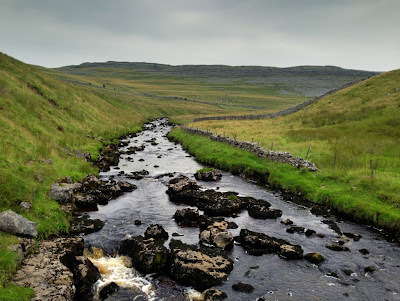 We reported already on the excursions to Ingleton Waterfalls and to the Lake District (courtesy KAIRA blog), and we wrote about the conference dinner. So let's have a look at the gifts. In the past, when for every conference a sometimes large programme and abstract book was printed, it was customary to issue a dedicated conference bag. With the advent of laptop computers, and thus everyone carrying a large bag anyway, these conference bags were all too often simply discarded. Nowadays programme and abstracts are published on-line, and maybe one gets a memory stick. Thus there's room for new ideas on conference give-aways. 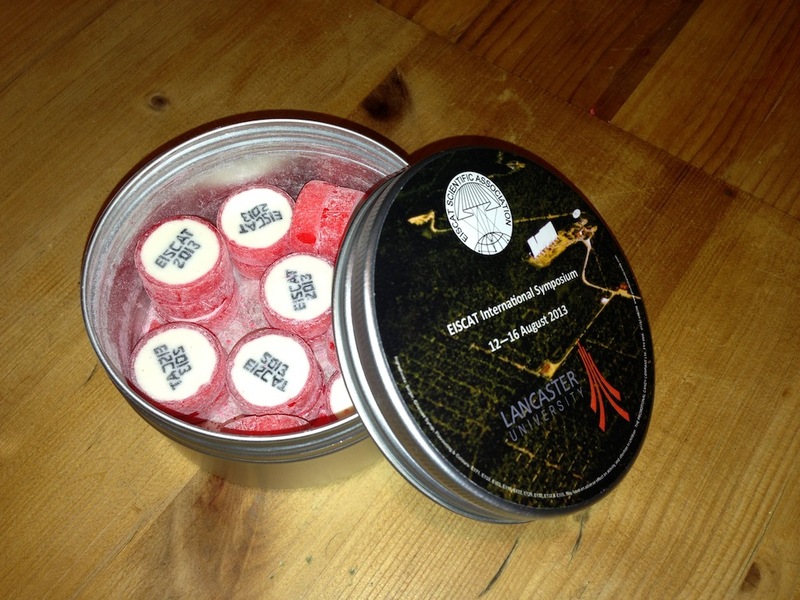 The photos above show what the organisers came up with for the EISCAT Symposium: a semi-automagic umbrella with EISCAT logo, and rock sweets with "EISCAT 2013" written on them and delivered in a tin with a photograph of the EISCAT site at Ramfjordmoen, near Tromsø, Norway. 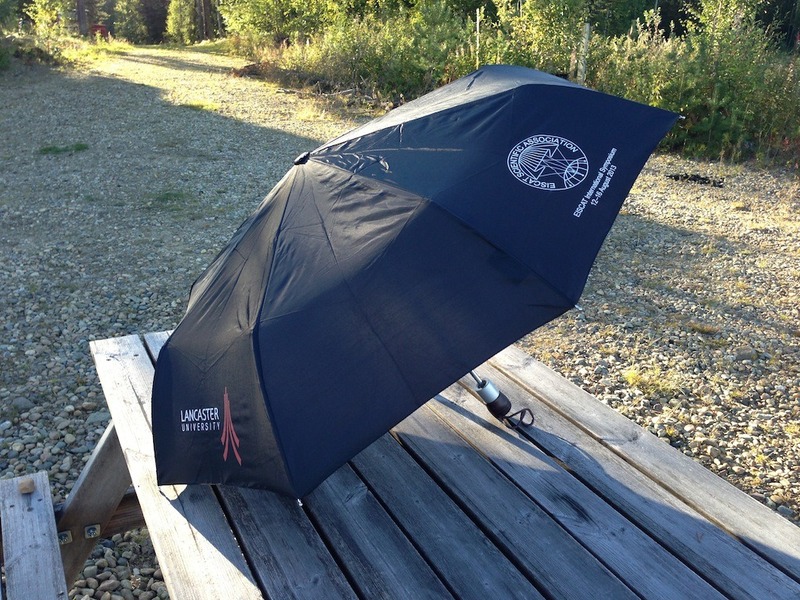 The umbrella opens upon pressing the button, and one has to use the button to close it, too. Just the pushing together is done by hand whereby the mechanism is recharged. The sweets are sweet and taste of mint. Thanks again to all organisers for a great meeting in Lancaster! On Thursday, 22nd August 2013, the all-sky camera of the Sodankylä Geophysical Observatory was deployed after spending the bright arctic summer in storage at the observatory. It wasn't yet focussed accurately, and it hasn't been calibrated yet (which needs to be done every year), but it was lucky enough to capture stunning Northern Lights during the short first night of operation. Images from the camera are available on-line in real time. Watch the short time-lapse film we made from the first night of operation. This colour film was made by overlaying the black and white images taken through the filter wheel at 557.7nm (green), 630.0nm (red), and 427.9nm (blue). The camera captures green images every 20 seconds, and blue and red images every minute. Playing the images back at 6 frames per second results in a time-lapse film where one second of film equals 2 minutes in real time. 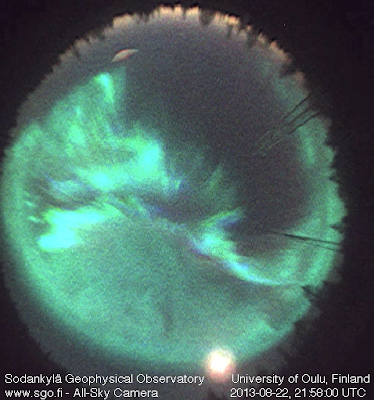 Photos: All-Sky Camera, Sodankylä Geophysical Observatory; colour and film: Thomas Ulich. 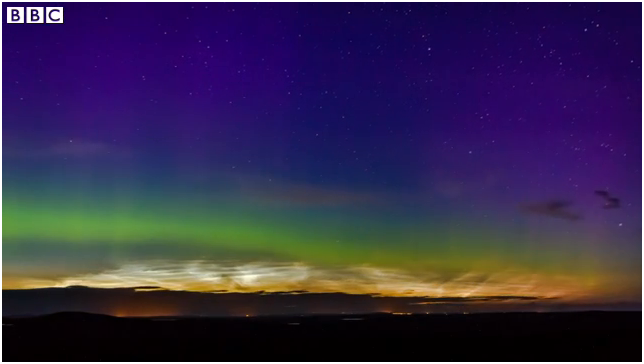 A couple of days ago, we were made aware of a fantastic movie taken in the area of Caithness, northern Scotland, by amateur astronomer Maciej Winiayczyk. He spoke to the BBC about his experience. Watch this amazing film here. By the way, if you are in the UK, the AuroraWatch UK service will be of use for you to hunt for the aurora in your area. This service is provided by our colleagues at Lancaster University, which also hosted the recent EISCAT International Symposium. Thanks to Asti for the link to the BBC article! 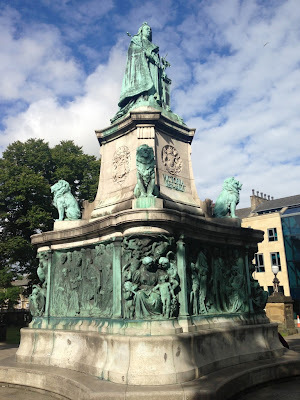 The 2013 EISCAT International Symposium in Lancaster, UK, ended on Friday, 16th August 2013. Before everyone disappeared, there was time for the obligatory group photo. There were just over 50 participants, 47 of which you can see here (someone always manages to hide). 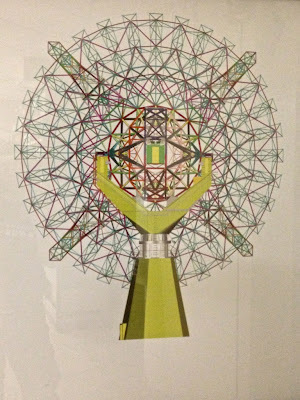 You can find the photo also on the Symposium's web page, but here it is for you to see. Please click on it for a higher resolution version. By the way, you might wonder when and where the next Symposium will be held. This has not been decided yet, except that there will, of course, be a Symposium in 2015, but location and time will be decided at a later date. Photo: Steve Marple, Lancaster University. On Thursday evening, the participants of the EISCAT International Symposium were treated to a banquet at Lancaster Town Hall at Dalton Square (previously). 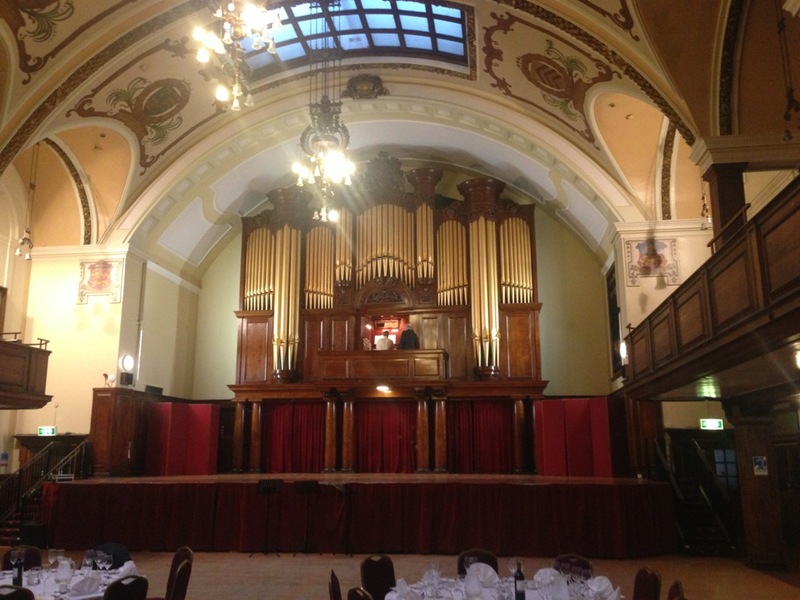 The town hall was opened in 1909, and features the impressive Ashton Hall, which is a public function and ball room. Three flutists entertained us during the evening. The main feature of the room is its organ. At the beginning of the evening, the "Lancaster Suite for Organ" was played for us on the instrument. The piece was commissioned by the Ashton Hall Organ Restoration Project. After the dinner there were a few speeches, during which two participants received awards. One award went out to the person who required the "vuvuzela treatment" twice for talking overtime, and the other award went out to the person who received a phone call from the author whose work he was presenting – at the time of the talk. 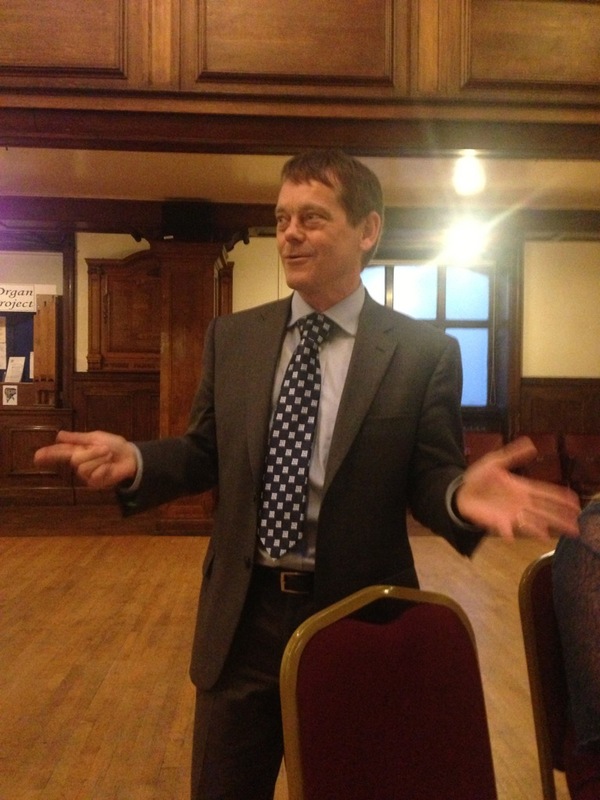 The photo above shows EISCAT Director Craig Heinselman thanking the organisers for a fantastic EISCAT Symposium. Photos: Thomas Ulich. Click photos to enlarge. On Wednesday afternoon, the participants of the EISCAT International Symposium had the chance to go on two different excursions into the surrounding countryside. 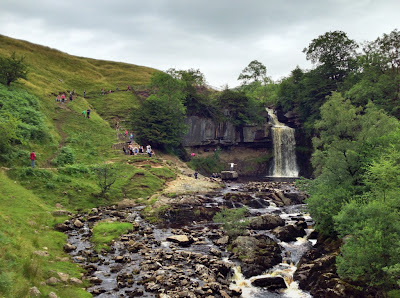 One of the options was a hike to the Ingleton Waterfalls, which have been popular with tourists since Victorian times: the path opened in 1885. 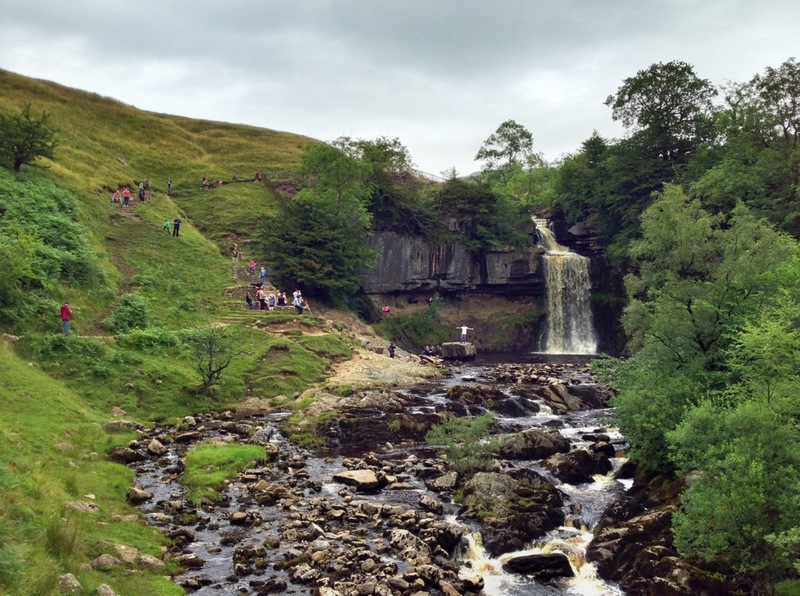 The waterfalls are set in a stunning landscape of grassy hills partitioned by stone walls and gardened by sheep. The dry stone walls were expertly built using rocks found in the fields they enclose. Also on the way back down, we walked along another stream with several waterfalls cascading their way towards Ingleton. Ingleton and the walk are located across the border in North Yorkshire, while Lancaster is in Lancashire. 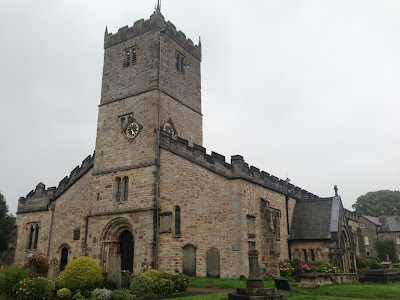 Our walk took about 2 hours and a half, after which we were shuttled to the near-by town of Kirkby Lonsdale, Lancashire. If you have visited Scandinavia, like most EISCAT users, you might recognise the word "Kirkby" to come from the Norse term for church village. Since everyone needed a drink after the hike, and it also had begun to rain, we sought refuge in the local pub the Orange Tree. 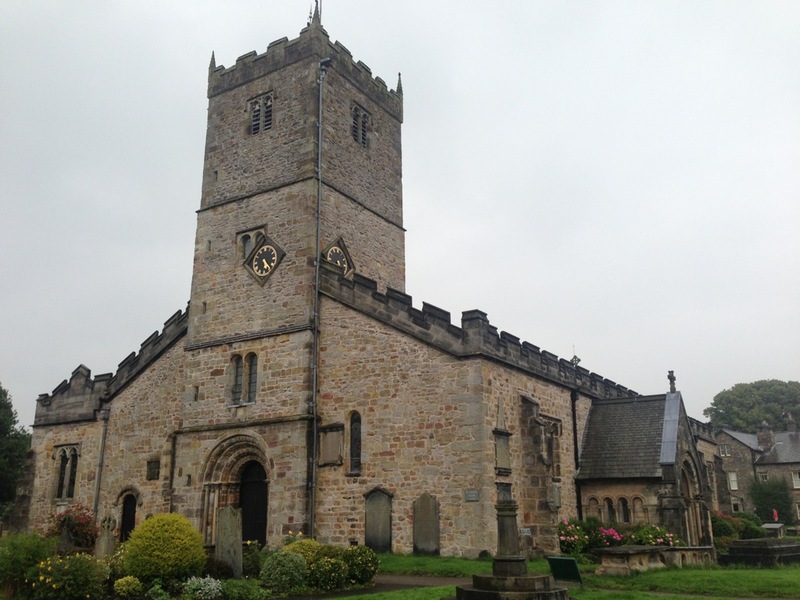 On the way from the pub to the coach, we visited St Mary's Church, which dates back to the 12th century. Finally we passed by what John Ruskin described as "one of the loveliest views in England," which was also painted by JMW Turner. 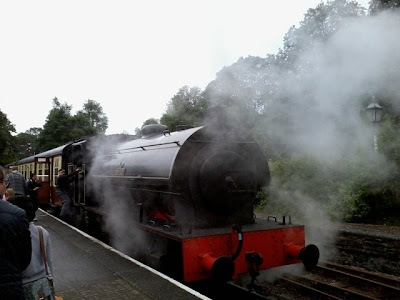 Here we have to make due with a simple photograph taken on a rainy day, but you get the idea. 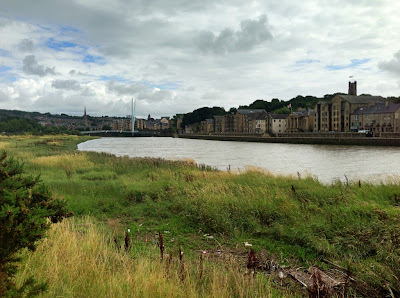 Many participants arrived for the current EISCAT Symposium at Lancaster, UK, on Sunday, 11th August, in time for the icebreaker reception at the conference venue. Walking over the railway bridge across the River Lune at 4 p.m. exactly, a surprise appeared on the horizon: four aircraft flying in formation. Once they came closer, it was possible to see what they were: an Avro Lancaster Bomber escorted by a Hawker Hurricane and a Supermarine Spitfire. Such fly-pasts are done frequently across Britain as part of the Royal Air Force Battle of Britain Memorial Flight. Unfortunately the only camera at hand was a phone, but anyway, here's the photo. The building in the background is the Ashton Memorial in Williamson Park, which overlooks the city of Lancaster. The pylons on the right are part of the Millennium Bridge. 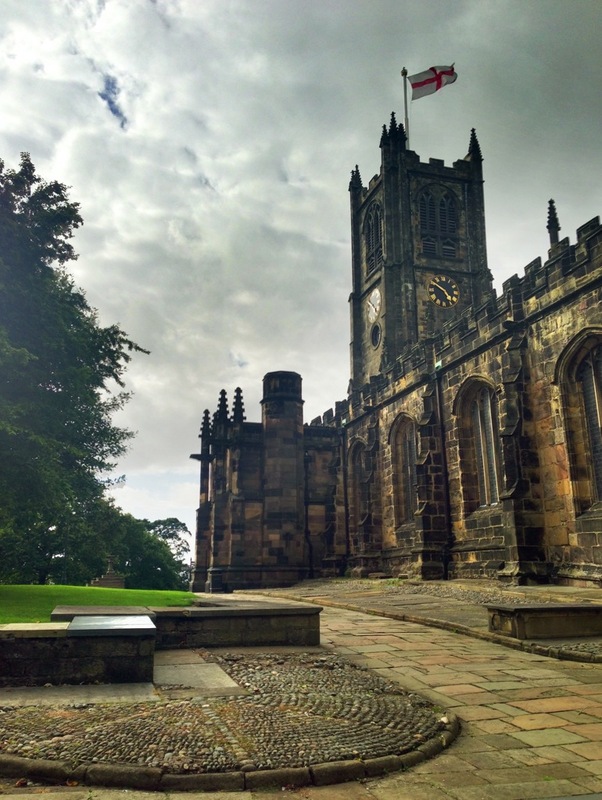 This year, the EISCAT International Symposium, formerly known as the EISCAT Workshop, takes place at the beautiful city of Lancaster, Lancashire, UK. 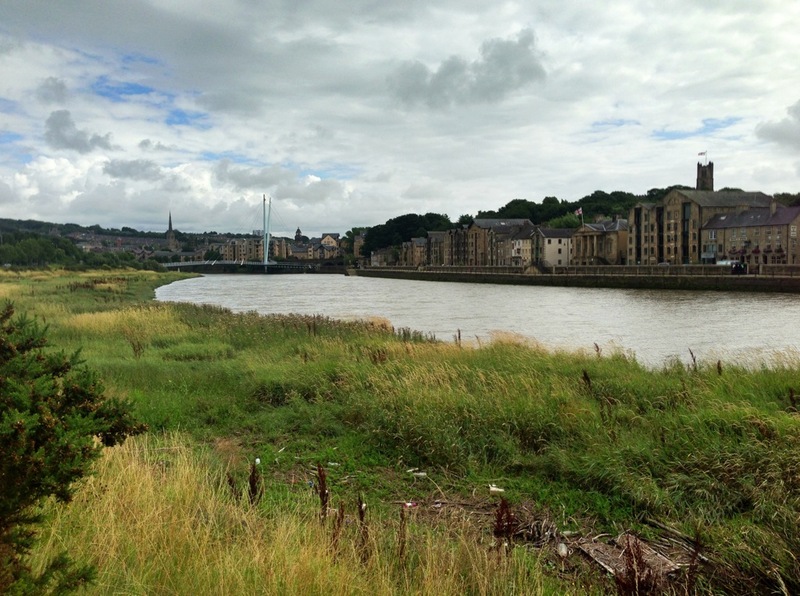 A few steps from the old centre of town, one reaches the River Lune. Crossing the Millennium Bridge (above, in the distance), there's a nice walk along the river. 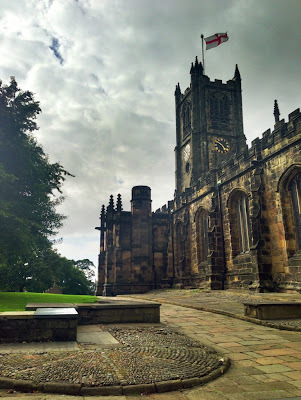 Crossing the railway bridge, and climbing up through a park, one comes to the Lancaster Priory, which is the parish church of the city of Lancaster. From the priory, walking down across the centre, one reaches the Lancaster City Hall at Dalton Square, over which Queen Victoria keeps a watchful eye. Since this morning, the EISCAT International Symposium is underway at Lancaster University, Lancaster, UK. The meeting will last all week, 12th to 16th August 2013, and it is followed by the meeting of the EISCAT Science Oversight Committee (SOC) on 17th and 18th August. The Symposium, formerly known as the EISCAT Workshop, was opened by the new Director of EISCAT, Dr Craig Heinselman, who used the opportunity to introduce himself. In the photo above, he presents a slide on a possible design solution for EISCAT_3D antenna arrays. It'll be an interesting week here at Lancaster. You can follow the progress here on the blog, on the EISCAT_3D Facebook page, as well as on three different Twitter feeds: @EISCAT_3D, @EISCATUK and @KairaProject. Photos: Thomas Ulich. Click to enlarge. 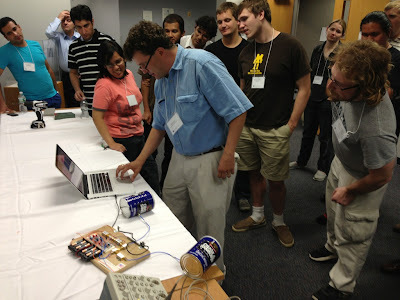 Juha Vierinen showed photos of the small radar built by his sons during this year's ISR School at MIT Haystack Observatory. Apparently I remembered so many things wrongly about Juha's small radar, that he kindly sent his original version to me. Since it is so much better than the one we published previously, here it is again, for your pleasure. You are more than welcome to leave your own annotations in the comments, or, indeed, why don't you build your own radar MOC? Oh, and don't worry, if some of the annotations seem to make sense to an insider only – I assure you I haven't got a clue either, it's just a lot of fun. But do look up those Blinkenlichten. Radar by Juha Vierinen's sons, photo by Thomas Ulich, annotations by Juha. Click to enlarge! 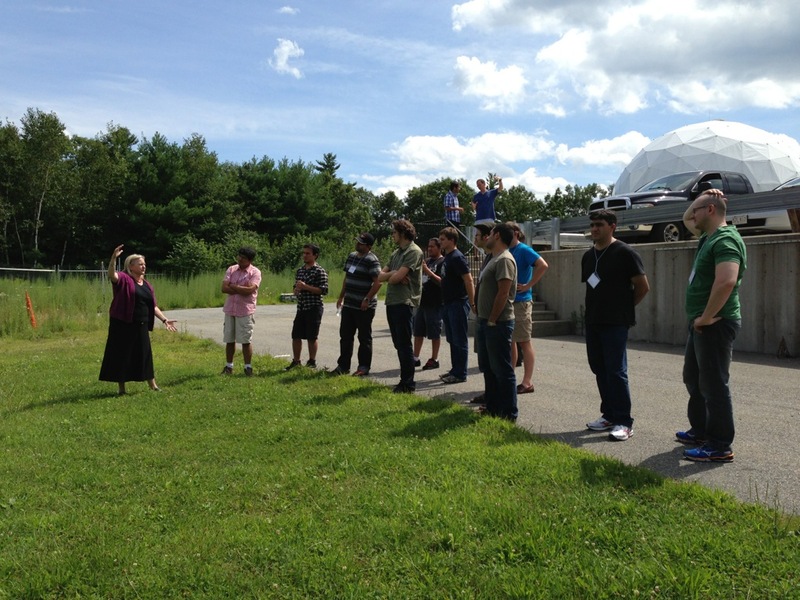 During last week's ISR School at MIT Haystack Observatory, it has been decided that next year's ISR School will be held jointly with the EISCAT Radar School at the Arecibo Observatory from 21st to 26th July 2014. Already in 2011 the schools were held jointly at Kangerlussuaq, Greenland, near the Sondrestrom radar, where it was planned to increase trans-atlantic co-operation in incoherent scatter radar by having joint schools regularly. Further announcements with details on how to apply etc. will be made during the autumn. Application deadlines for both schools will be identical, but through separate registration pages. The deadline is anticipated to be in early 2014. Our colleague Juha Vierinen, who recently completed his PhD at Sodankylä Geophysical Observatory, has arguably the smallest radar at MIT Haystack Observatory in his room: a LEGO radar built by his sons after they visited the observatory. 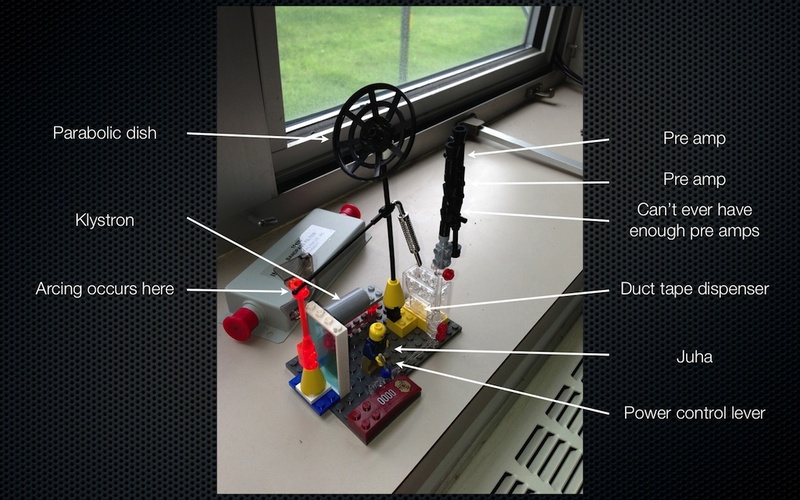 In his lecture during the ISR School, he showed an annotated photo of this MOC – an acronym used among LEGO enthusiast meaning "My Own Creation", some of the details of which we try to relay to your in the image below. At the moment it is unclear, if Juha plans to connect the bandpass filter (grey box in background) to the radar. With these images we say good-bye to MIT Haystack and to Boston, since this year's ISR School has ended now. The time and location of next year's ISR School has been decided, and we will let you know on Monday. Stay tuned. For now, have a nice weekend! 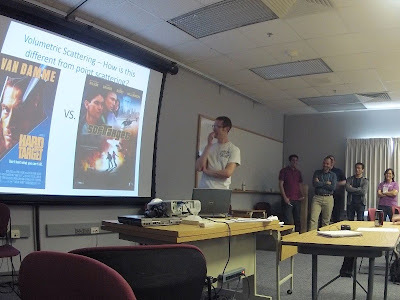 Already on Day 2 of the present ISR School at MIT Haystack Observatory, Phil Erickson (at the laptop) showed us his low-cost radar. He revealed this experiment to the school for the first time in Banff last year, and we reported about it previously, including links to the instructions. Above, the radar electronics are mounted on a wooden board, and the antennae are made up of two coffee cans (a.k.a. cantennae). This week, too, the demonstrations was a great success, and a lot of fun was had by everyone. 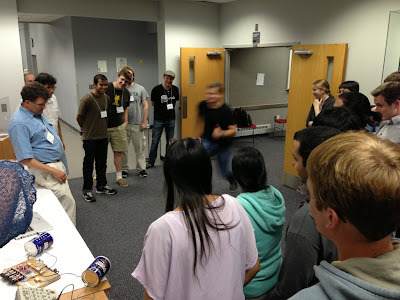 Here we tried to measure the velocity of one of the participants running towards the radar. Later on, Juha Vierinen demonstrated his own, slightly less low-cost version of a cantenna radar. He used an Universal Software Radio Peripheral (USRP) to replace most of the basic electronics, but this allows him to make more sophisticated measurements. In the photo above, he tried (successfully) to create an "F-region" double-hump spectrum by moving his hands rapidly in opposite directions. On the third day of excursions during the ISR School, he had a tour of the Millstone Hill Incoherent Scatter Radar, i.e. the facility, which brought us to have the school at the MIT Haystack Observatory. The radar operates at 440 MHz with a peak power of 2.5 MW. On of the great advantages of this radar is its large observational range: it is located atop of the hill, and can measure at very low elevation, giving it an exceptional reach. The movable dish has a diameter of 46 metres and was added to the facility in 1978. In the foreground, Bill Rideout is waiting for a good photo opportunity of the group on the opposite site of the road. 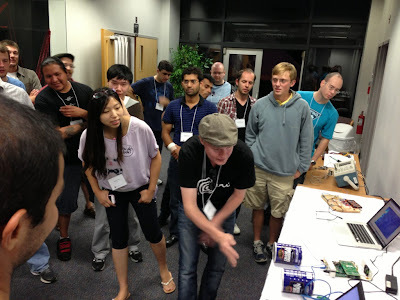 Bill is one of the instructors of the school and the main developer of the Madrigal database, which holds the world's incoherent scatter radar data. Phil Erickson, one of the instructors of the ISR School, showed us around the facility. Here he explains the wave guide to the group of participants. Both ISR dishes are in the background: closer by the zenith dish, in the background the movable dish. 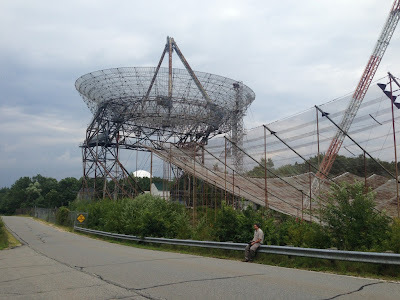 The tour of the Haystack Radio Telescope (see previous post) included also a visit to the RAPID array. 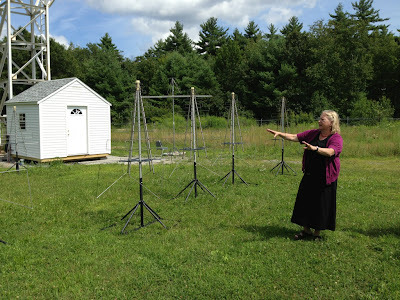 RAPID (radio array of portable interferometric detectors) is a development project of MIT Haystack Observatory, which aims to build an array of solar powered, wireless, and deployable broad-band antennae. The array is intended to have a broad range of applications in studies of the Geospace environment as well as Astronomy. The antennae in the photo above are called SKALA (SKA Log-periodic Antenna), developed by the Cavendish Lab at Cambridge University, UK. 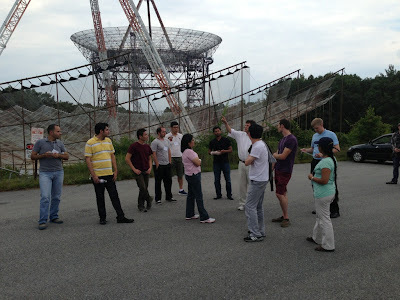 Anthea Coster, above, showed the ISR School participants around the array. Here she tries to make them levitate – actually some suggested to deploy the antennae by drones. Two of the six groups of the radar school tour the observatory at the time, visiting different facilities during three afternoons. Just visible in the background is the radome of the space debris radar. Following up on the previous blog post on the upgrade of the Haystack Radio Telescope, today we got the change to visit the telescope. 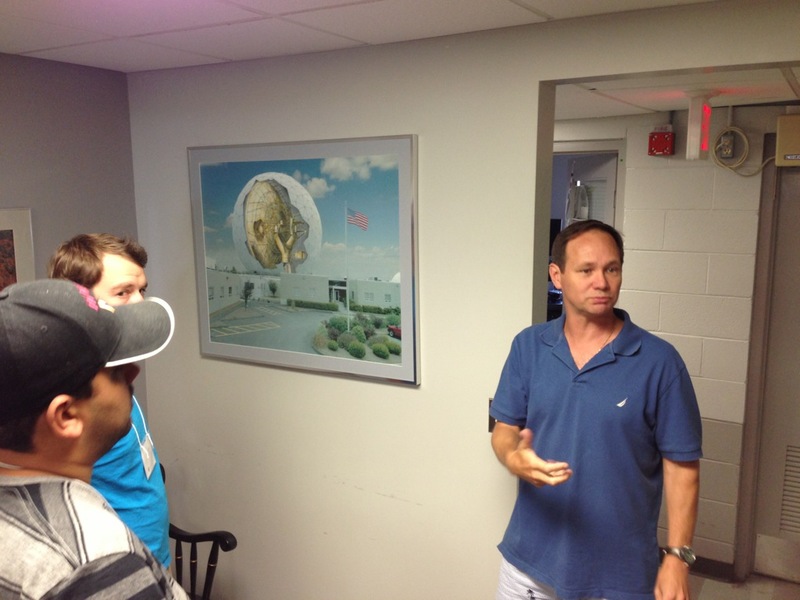 Chester Ruszczyk, above, explained the telescope part of the facility. The telescope doubles as a 95-GHz radar for the US Air Force, which unfortunately is classified, so our radar school wasn't allowed to visit the transmitter area. 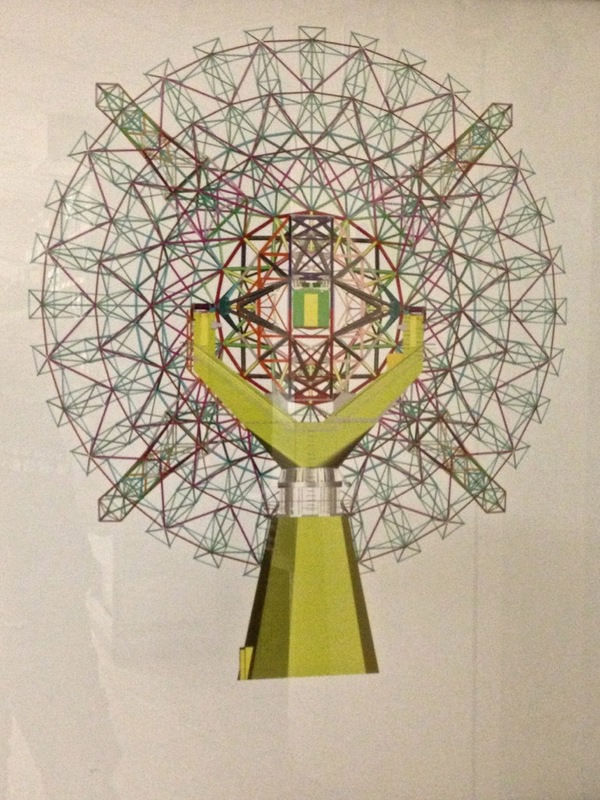 The image on the wall next to Chester is a hybrid photograph/drawing showing the building hosting the ISR school in this week with a cut-away view of the radome. The parabolic dish has a diameter of 37 metres and moves at the impressive rate of 5° per second (EISCAT Svalbard Radar 3°/s, EISCAT UHF 1.5°/s)! We learnt that 37 meter that was the maximum size to fit into this radome, which was donated to the lab. 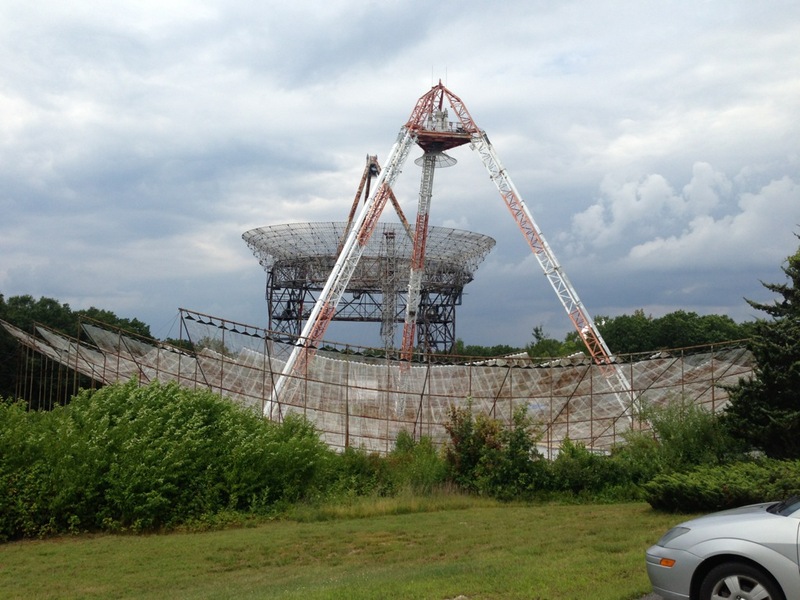 The recent upgrade of the facility included a reconstructed parabolic dish, the surface of which had to be built accurately enough for the 3.2-mm wavelength of 95 GHz. The drawing above gives a rough impression on how the dish is built. 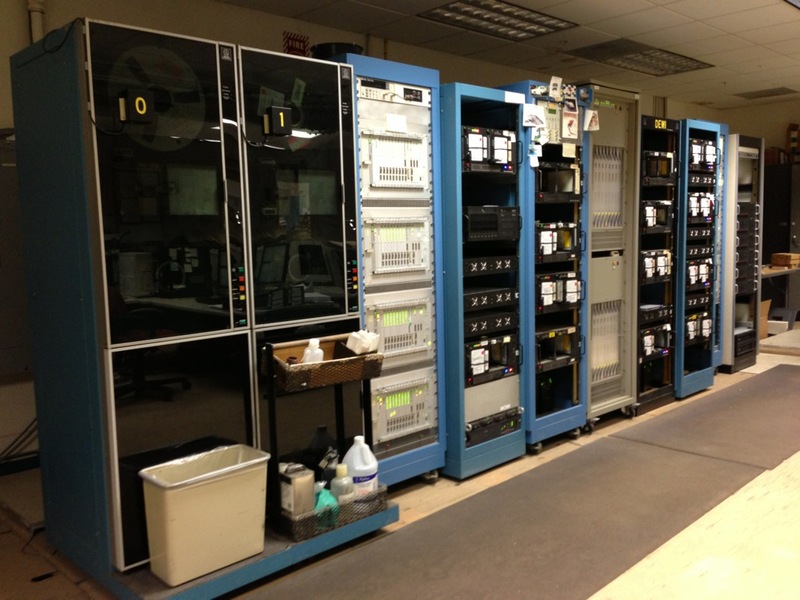 We were also introduced to the correlator in the receiver room, which is housed in a number of large racks. This is not unlike the equipment found in all EISCAT control rooms before their refurbishment in 2000. The rightmost rack in this image shows the new correlator, which is fully digital. 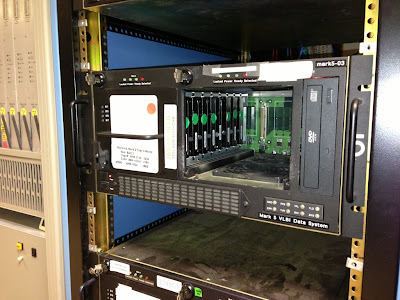 The old correlator is kept on-line in order to allow fast fallback in case the new system fails – a very reasonable precaution during an intermediate time before decommissioning of the old system. A remarkable technical development of MIT Haystack Observatory is the VLBI recording system. The photo above shows the Mk 5 recording system, which contains two large slots for compact 8-disk arrays (Mk 6 is available now). Here, one of the slots is empty. The disk arrays are on very sturdy chassis, which are meant to be shipped across the world for data processing. VLBI (very long baseline interferometry) requires the simultaneous use of multiple radio telescopes at far-away locations on the globe for astronomical imaging. The data rates are too high in order to collect all data streams at central processing facilities in reasonably short times. Thus data from all radio telescopes are combined by sending all of these disk arrays to the same processing facility.